Note: If the model becomes unstable, reset the model and reduce the computational timestep dt. © 2018, Wolfgang Christian; Francisco Esquembre; lookang. This model is constructed using the Lennard-Jones potential truncated at a distance of 3 molecular diameters. The motion of the molecules is governed by Newton's laws, approximated using the Verlet algorithm with the indicated Time step. For sufficiently small time steps dt, the system's total energy should be approximately conserved. 1. When a substance gains or loses heat, the substance may change its temperature, change its state, change its volume or change to a different substance. The kinetic model allows us to understand the macroscopic properties of matter and changes in its state in terms of its microscopic molecular structure and behaviour. 2. Energy may be transferred through all materials and through free space (vacuum). Our understanding of the different mechanisms of heat transfer through different materials enables us to control and make use of heat transfer in many appliances and machines. 3. Internal energy of a body consists of the total kinetic energy and potential energy of the particles in the body. Changes in a body or a substance due to heat gain or heat loss may be explained by the change in its internal energy. 4. Thermodynamics is the study of the relationship involving heat, mechanical work and other aspects of energy and energy transfer. The first law of thermodynamics is a general statement of the law of conservation of energy that includes energy transfer through heat as well as mechanical work. The ideal gas equation gives the relationship of the pressure, volume, temperature and number of moles of a gas. This equation allows us to find the state of a gas in any situation. How can we explain the effects of heat gain or heat loss on matter? • The physical properties of solids, liquids and gases and their molecular structures may be related to the forces and distances between molecules and to the motion of the molecules. • When the temperature of matter (solid, liquid or gas) increases, thermal energy is transferred to the molecules and the molecules gain kinetic energy, causing them to move faster. • The pressure exerted by a gas may be related to the collisions of the gas molecules with the walls of the container, causing a force per unit area (i.e. pressure) acting on the container. Using the kinetic model, we can explain the relationships of the pressure, volume and temperature of a gas. • there are three states of matter - solid, liquid and gas. The states of matter may be defined by their physical properties. • water can exist in the solid, liquid and gaseous states. A change of state can occur when water gains or loses heat. • solids, liquids and gases can expand when they are heated (gain heat) and contract when they are cooled (lose heat). • matter is made up of small discrete particles which are in constant and random motion (kinetic theory of matter). The space between particles, their arrangement and movement determine the characteristics of the three states of matter (solid, liquid and gas). • models (like particulate model) are constructed, justified and continuously revised as new evidence is gathered to explain a phenomena (e.g. properties of solids, liquids and gases, and changes of state such as melting and boiling). • generally, solids, liquids and gases expand when heat is absorbed and contract when heat is given out. A notable exception is water. • effects and applications of expansion and contraction occur in everyday life. Heat gain/loss: Students have difficulty understanding that heat is energy in transit. If heat transfers to or from a substance, the substance may change its temperature, its state, its volume or change to a different substance. heat and cold are kinds of substances that flow into and out of materials, when in fact, only heat is transfer as a result of collision between high energy particles to low high particles. objects can have a certain quantity of heat in them, when in fact the concept of internal energy ( stored potential energy U) is different from heat transfer, Q.
individual particles move in random motion, when in fact they move in constant direction and speed until a collision with another particle or wall, the random motion is the pollen in Brownian motion. particles seek to move down a concentration gradient during diffusion, when in fact each particle move in constant direction and speed until a collision with another particle or wall. It is actually the system of collisions that causes the diffusion to spread through higher concentration to lower concentration. particulate motion stops when the particles are uniformly distributed in the fluid mixture, when in fact they still continue to move about just that the sum of the system of particle is in dynamic equilibrium. Explore how molecules in a gas move relative to each other. Molecules are in constant motion. 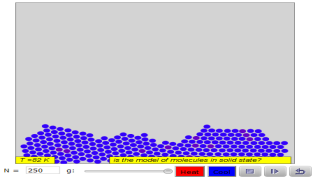 "Mark two atoms," then run the model to see how the molecules move relative to each other. How do the distances between gas molecules change over time? Explore how molecules in a liquid move. Molecules are in constant motion. "Mark two atoms," then run the model to see how the molecules in a liquid move relative to each other. How does the movement of molecules explain why liquids take the shape of their containers? What does a solid look like at the molecular level? Molecules are in constant motion—even those in a solid! "Mark two atoms," then run the model to see how the molecules in a solid move relative to each other. How would you describe the movement and arrangement of molecules in a solid? Explore how states of matter are related to the strength of intermolecular attractions. There are three states of matter—solid, liquid and gas. Run the model and change the strength of attractions between the molecules. How does changing the force of attraction between molecules affect the state of that material? Explore how energy input causes matter to change states. Matter exists as solids, liquids and gases, and can change state between these. The model shows a liquid material on the left (small atoms). The amount of heat energy is shown by kinetic energy (KE) shading, with deeper shades of red representing more energetic atoms. On the right side of the barrier is a solid material (large atoms). Run the model. How much energy is able to penetrate the barrier? Remove the barrier. How quickly do the more energetic atoms melt the solid?